There is no need for you to open the back cover of Xperia Z Ultra if you want to insert the micro SIM or microSD Memory card. It's because the slot for both SIM and Memory locates on right side (from front view) of the device. The 3050 mAh Li-ion battery also no need to be removed. It's non-removable type. The Xperia Z Ultra is also designed without removable back cover/casing. On the right side of the phone, find the cover of the slot by looking for the side that has "microSD" word. That's the exact location the slot's cover. Under the cover, there is small gap in there (right below the "microSD" word). Insert your finger nail at this gap then with a little pull out, make the cover out and then you can detach the cover. There's no need to worry on losing the cover, the cover would "hang" at the Xperia Z Ultra because there is a kind of hinge. After detaching and opening the slot cover, you'll find two slots inside. Following the Picture above: The left side slot is for microSD Memory card, and the right side slot for microSIM card holder. To re-attach the cover, all you need to do just getting back the cover to the slot position horizontally, align it with it, the press it against the body of the Xperia Z Ultra. Make sure the cover attach properly, it because the cover is important part that prevent water or dust on being invades into the slot of the SIM or memory. This cover is the key on getting IP58 dust and water proof and resistant. To insert the micro SIM card into Sony Xperia Z Ultra, after you detach the cover of the slot, you need to pull out the microSIM card holder from the its slot. Just use your fingernail to draw the holder out (pictured). After you pull out the holder from the slot, place the micro SIM card with gold-contact facing upward in to the holder. Make sure that the cut-edge of the SIM align in the same position of the holder (outside, pictured). 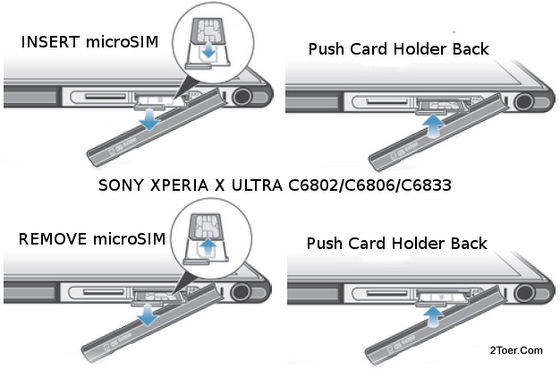 Then Just slide and push the SIM card holder with the microSIM card inside back to its slot of Sony Xperia Z Ultra. Then re-attach the cover. If you want to remove the microSIM card, you just need to do the same steps as the way on inserting the micro SIM. Detach Cover ~> Pull out the holder ~> remove the microSIM Card from the holder ~> insert the holder back to its slot ~> Reattach slot cover. There is no card holder for microSD Memory Card. Therefore it's simpler to inserting the microSD Memory than the way you need to know how to inserting the microSIM card. Detach the slot cover with your fingernail as I have given you the tutorial on "Cover" tab, then with gold-contact of the microSD Card facing down, align the Memory card with the Memory slot (pictured) then push it into the slot until it reachs end of the slot. When you hear "clack" sound that the indicator that the microSD locks onto the slot. You've done on inserting the Memory. Reattach/ close the cover back. To Remove the microSD Memory from the slot, just detach/open the cover of the slot, then push the microSD card with your fingertip or fingernail against the slot, then release it. If the Memmory Card pop out, that means you do the right way. The Memory is unlocked. pull out the card from its slot, and reattach/close the cover of the slot. Done. Do not forget to unmount the SD Card before removing the memory card: Tap Settings ~> Storage ~> Unmount SD card. If you detach the slot cover of Sony Xperia Z Ultra, exactly on the right side of the micro SIM slot holder, you'll notice that there is a small button in there (with "OFF" letter). 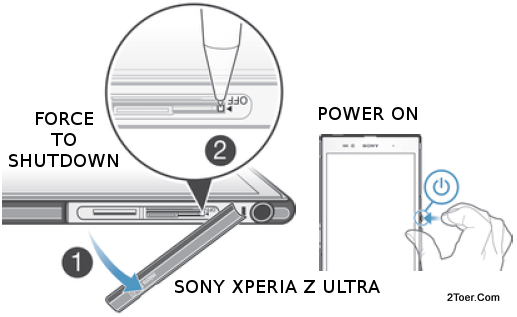 If you press and hold this small OFF button with pen tip or tip of paper clip, the device would be force to shutdown, whatever condition the Xperia Z Ultra had. This OFF button is very important in case you experience that the Xperia Z Ultra stop responding, hang, freeze or the touchscreen is not respond to any touch. You press and hold, the device shutting down. Press power button until the phone vibrates, then the device would turn on. This also means you can do force restart or reboot with this action. Resetting the Sony Xperia Z Ultra can be done by this steps: Apps ~> Settings ~> Back up & reset ~> Factory data reset ~> Reset phone ~> Erase everything. You can also find the Settings by: Drag the status bar downwards ~> Tab settings icon on the top right side ~> Backup & reset ~> Do the rest. Backup is needed if you don't want to lose any document data or picture or videos before doing this hard/master reset. Be wise!